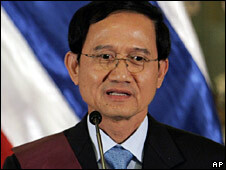 Thai Prime Minister Somchai Wongsawat has rejected calls by the country's military chief to stand down. Army leader Gen Anupong Paochinda had asked him to call snap elections to end months of political deadlock. But Mr Somchai said his government was legitimate and that he would continue to work for the country. The call came after anti-government protesters occupied Bangkok's main airport and forced its closure, a move that Mr Somchai called illegal. "I reassure the people that this government, which is legitimate and came from elections, will keep functioning until the end," Mr Somchai said in a televised address. "My position is not important. But democratic values are," he said, speaking from the northern city of Chiang Mai. He returned from a foreign trip earlier in the day but was unable to land in Bangkok because of the airport blockade. Shortly after he arrived in Chiang Mai, a man was killed in a clash between pro- and anti-government supporters, police said. Thailand has been in a state of political stalemate since former Prime Minister Thaksin Shinawatra was ousted in a military coup in 2006. Gen Anupong's call for polls earlier in the day heightened speculation that another military coup could be imminent. But the army chief denied that was his plan, saying the government still had "full authority". A Thai court, meanwhile, has ordered the protesters occupying Suvarnabhumi airport to leave. But the group - who belong to the People's Alliance for Democracy (PAD) - say they will stay until the government resigns. They have brought in food and blankets and appear set for a long stay. All flights have been cancelled and thousands of Thais and foreign tourists are stranded in the Thai capital. 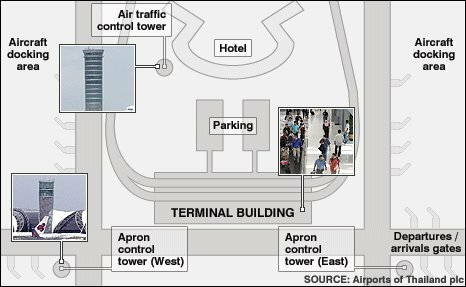 Frustrated passengers have been sent to hotels until the airport, one of Asia's busiest, can reopen. The campaign by the PAD, which began in earnest in May, has paralysed the Thai government. The group - a loose alliance of royalists, businessmen and the urban middle class - claim that the government is corrupt and hostile to the monarchy. They also accuse it of being a proxy for Mr Thaksin, who remains very popular among Thailand's rural poor.